You can choose to download our order form from the links to the right and fax the form to us, or fill out the order form online from the choices below and submit them through this website. To order online please fill out the relevant section of the order form that matches your planting year. Once your order is received we will contact you in regards to the total cost of the vines, freight to your vineyard, cold storing and any other information that will tailor the order to your planting timetable. PRICE - $4.80 + gst per unit Minimum order for Grafted Vines is 500. Peat Pot Grafted Vines are transported direct to your vineyard for planting. PRICE - $5.50 + gst per unit Minimum order for Peat Pot Grafted Vines is 500. 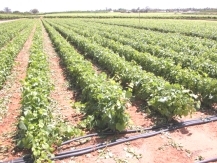 PRICE - $4.80+ gst per unit - Minimum order for Grafted Vines is 500.